If they can, even the most pessimistic Bears fan will have to feel good about the direction of the franchise. If they can’t, we’ll be looking at major changes once again with Cutler certainly being sent packing and Fox possibly joining him too. The coach and the quarterback are two of the three most significant positions in a franchise. 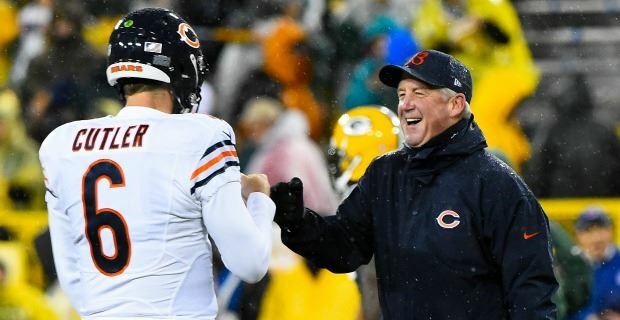 These final eight games offer Fox and Cutler a chance to prove to Pace that they are answers, not questions. It sure seems like Ryan Pace wants “his” quarterback sooner rather than later. Pace was seen at the Miami game, almost certainly getting an in-person look at Miami quarterback Brad Kaaya for the second straight week. A week earlier he saw Kaaya and Notre Dame’s DeShone Kizer and took a look at Clemson’s Deshaun Watson earlier this season. He’ll surely see North Carolina’s Mitch Trubisky at some point and surely has a full scouting report already done on Jimmy Garoppolo. But this isn’t new. Pace wanted to make a move for Marcus Mariota two years ago and did his homework on Carson Wentz last year. But he never could make a move. Depending on who declares for the draft and if the Patriots make Garoppolo available, there could be more fish in the pond this year. If Pace rates any of these players as franchise quarterbacks, he should absolutely make a move for them. Cutler is 34 and gets injured every other year. You grab the next guy when you can because you never know when you’ll need him. Even if that means spending a first round pick on a player because developmental quarterbacks are more of a myth than reality. But Pace has shown he’s willing to go forward with Cutler and he won’t mortgage the future to replace him. And, even if he drafts a quarterback in the first round, there’s no real reason to move on from Cutler and throw that quarterback to the wolves right away. Pace is doing his homework, as he should. Just because he’s scouting, it doesn’t mean he’s liking what he sees. Ultimately, his legacy — like most GMs — is going to be defined by what he does at the quarterback position. The Bears defense could get a big boost this week when defensive tackle Eddie Goldman returns from an injured ankle suffered late in the debacle against Philadelphia. As good as Akiem Hicks has been this season, he isn’t even the team’s best defensive lineman. That’s Goldman, who gives the Bears two mammoth freak athletes who can do just about everything they’re asked to do. With Goldman taking all of Will Sutton’s and most of Mitch Unrein’s snaps, the Bears should be able to play two down defensive linemen almost every down. With those two controlling the middle of the line and the trio of Willie Young, Lenny Floyd and Pernell McPhee outside, this front seven could be special. • It shouldn’t be a surprise to anyone that Willie Young leads the Bears, according to my chart, with 25.5 quarterback disruptions. He, of course, leads the team with six sacks to go with 16.5 hurries and two hits. The surprising part is the guys who are in second place as both My Boy Corny Washington and Hicks are tied for second with 14. We didn’t even know if Washington would make the team, but he’s proven to be an effective pass-rusher. Hicks was billed as a run-clogger, who didn’t provide any rush, but has proven that to be flat out wrong with four sacks already this season. Floyd is third not he team with 10.5 disruptions. • It also shouldn’t be a surprise that Bobby Massie has given up the most pressures amongst the team’s offensive linemen with 20. That total is just one more than Charles Leno, although Leno has faced better pass rushers. The interior of the offensive line has been solid as Josh Sitton, Cody Whitehair and Kyle Long have given up a combined 12 disruptions. Whitehair leads the team with 12.5 bad runs, however, 4.5 more than Long, who is in second place. • The quarterback’s accuracy has actually been pretty close. Brian Hoyer has been inaccurate on 29 percent of his passing attempts, while Cutler sits at 25.9 percent. The majority of Cutler’s came while he was being pressured or hit, however. Matt Barkley leads the team as he was inaccurate on 46.6 percent of his attempts. As good as it feels to be a Bears fan right now, it could all waste away if they don’t beat Tampa Bay this week. The Buccaneers are scary. The Bears’ defense forces quarterbacks to be disciplined, but Jameis Winston is the kind of guy who likes to push the envelope. Doing so with Mike Evans against any of Chicago’s defensive backs could be bad bad news. The good news for the Bears is that the Bucs can’t stop anybody. They’re 29th in scoring defense, 28th in yardage — ranking 25th against the run and 29th against the pass. They’ve given up 30 or more points in half of their games — including two 40 burgers — and the only teams they really slowed down were Carolina with Derek Anderson and San Francisco. We’ve been waiting for a game in which Cutler explodes statistically and this really should be it. The rest of the offense is relatively healthy and the Bears are coming off of a bye week.